The women who worked at the Orchids of Asia Day Spa were victims of human trafficking. They had little choice but to try and earn a living by giving massages and hand jobs to pay the thousand dollars a month they were being charged to sleep at the massage parlor on cots; living on fast food and whatever they could keep in the mini fridge that didn't require cooking. They were essentially slaves, never earning enough money to escape. But the owner of the spa, Hua Zhang, would end her work day at the massage parlor and go take care of the kids at her $400,000, 4 bedroom home. The children in her care weren't her own though, like the women at the massage parlor, these were tenants. Unlike the women at the massage parlor, these tenants were the children of wealthy Chinese parents, sent to America to attend grade school. So besides prostituting trafficking Chinese immigrants, Madam Zhang had a business caring for Chinese children, providing room and board along with tutoring for Chinese children. The pictures in the header show some of the kids along with three of the women arrested in the Asian massage parlor sting that made headlines because Robert Kraft was also arrested. Ruimei Li is on the left in the blue shirt. Lei Wang is in the red dress and Hua Zhang is in the striped shirt on the far right. Hua Zhang and her partner, Sheng Luo (who is probably her son), registered several businesses in Florida which are probably related to their room and board enterprise, Golden Lake Education and Bomei Group. Neither business appears to be licensed for providing care for children or lodging for paying guests. Madam Zhang and Luo have a website registered in Luo's name which promotes the business in Chinese. That's where the picture in the header came from. There are more pictures which include the Massage Parlor Madams posing with children. On the website, Zhang and Luo offer parents a choice from 3 homes in 3 cities. Each of the properties is owned by Madam Zhang or one of her holding companies. 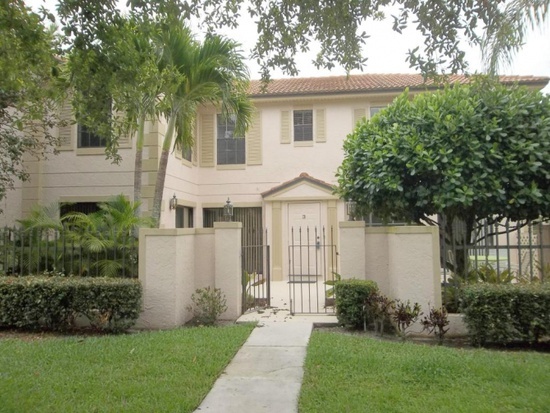 One option is a $250,000 condo in Palm Beach Gardens. The children would attend Timber Trace Elementary. Another option is a $250,000 home in the Ocean Parks condominiums, just a few blocks away from the Orchids of Asia day spa. The kids would attend Jupiter Elementary School. 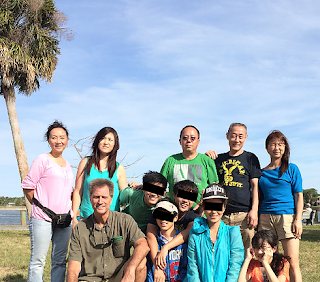 In Hobe Sound, Zhang's 4 bedroom home was offered with the kids attending Hobe Elementary School. 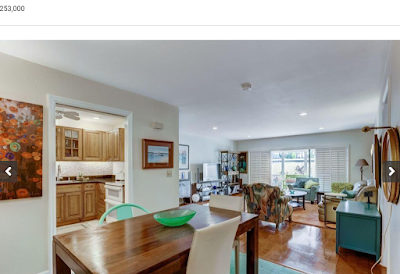 Below is a video tour of the home. 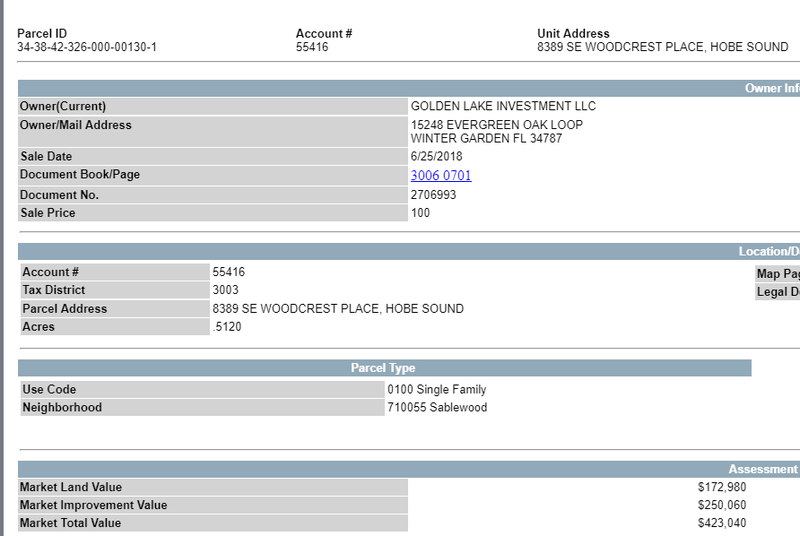 The Hobe Sound home was sold by Madam Zhang for $100 to Golden Property Investments, a holding company she owns with Sheng Luo. Mei Zhang and Hua Zhang in the document below are the same person. Zhang's full name is Hua Mei Zhang. She switches between using her first name and second name depending on what she's doing. Or who she's doing. The address for Golden Lake Investment LLC is 15248 Evergreen Oak Loop, Winter Garden Florida. This is another property owned by Madam Zhang. 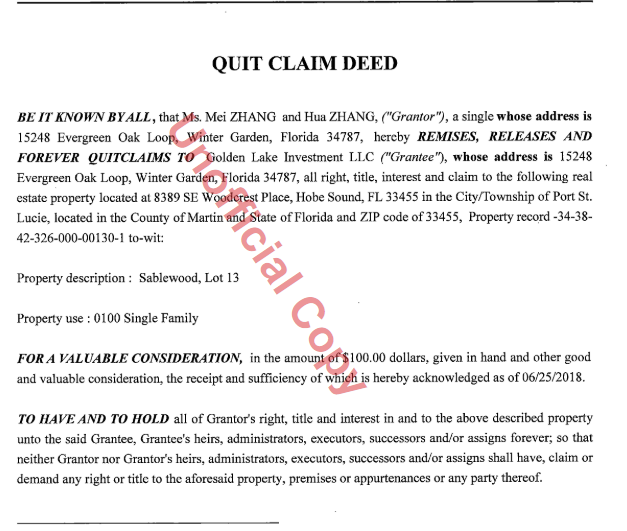 Also living at the Winter Garden home is Sheng Luo and his new wife, Xuan Wu. Running a private boarding home business where foreign children can be cared for while they attend school in America is a great idea. But I'm pretty sure it needs to be licensed. And I'm pretty sure that parents, as well as the elementary schools involved, should be aware that the business is run by a woman who profits from prostituting women and is engaged in human trafficking. The massage parlors and boarding homes still don't account for all the money involved with the massage parlors and homes. 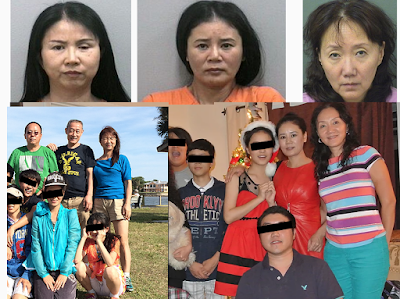 The women (and their bank accounts) are being investigated, so hopefully we'll see an end to the trafficking and whack a mole massage parlors in South Florida.